If you are out and about nature watching this afternoon anywhere within 43 degrees of the equator (which includes most of the inhabited world south of the Himalayas, Pyrenees or Appalachians depending upon the continent from which you are observing) you may see a strange orange glow in the sky. For sometime today the Chinese space station, Tiangong-1, will make its fiery descent back to Earth. If you are in England and see a strange orange glow in the sky then that will probably be the sun, an astronomical object that older readers may dimly recall. Today, March 20th, sees the arrival of the Spring Equinox in the northern hemisphere (or the Autumn Equinox in the southern) where the daylight hours equal the night time hours; twelve of each. Here in Crete the weather is starting to warm up, hitting the 30C mark on some days and nothing could be pleasanter than to bask on the terrace of the Sxedia (The Raft), looking out over Ierapetra with the last vestiges of snow on the Dhikti Mountains in the background. It is also a lovely place for us to sit and chat about the things to look out for in early Spring so pull up a chair and we'll begin. Chamomile tea anyone? 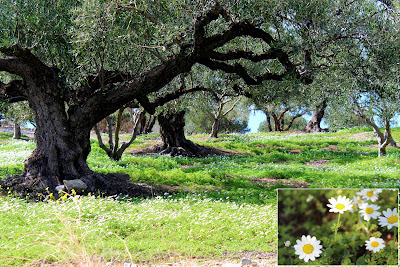 Back down here in the olive groves, below the high peaks, the space between the trees is awash with white, scented chamomile interspersed with wood sorrel; a testament to the lack of herbicides and pesticides used in these parts. This is not the species that is used in the commercial production of chamomile tea but it is closely related and just as efficacious as a pleasant, restful beverage. Just steep 3-4 tablespoons of flower heads in a mug full of boiling water for 5 minutes and decant into a second mug. The rain has been; the sun is shining and orchids are appearing all over the Kritiweb. I have a confession to make: I am not a great fan of orchids (but I'm sure we'll find some later on for those of you who are). Meanwhile, we have some serious climbing to do today to get onto that rocky ridge up there so let's have a look at some of the other flowers that are dotted around the hills. 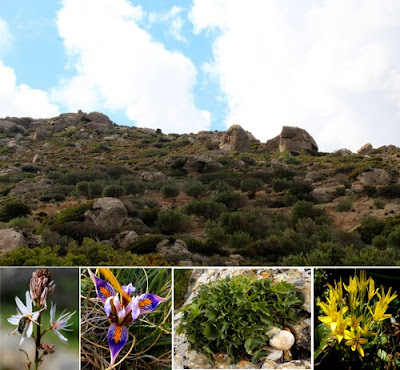 The tall white ones that our friend the Tropinota beetle is pollinating are Asphodels and the exquisite little purple and gold blooms are a subspecies of dwarf Algerian Iris that is endemic to Crete and Karpathos. Not everything is in flower yet but this rock lettuce (another Cretan endemic which will have spectacular 80cm blooms in April) is just ripe for picking a few salad leaves. Finally, these little clusters of golden sunshine are Gageas, one of seven species that we have here on Crete.